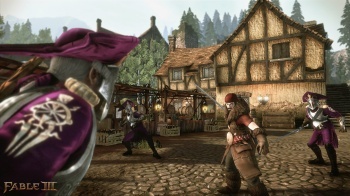 The lead combat designer of Fable III goes off on why his game wasn't received better. By most accounts, including Susan Arendt's, Fable III was no masterpiece. It was good, sure, the game had some great features while others that were just annoying. Both the critical and commercial reception to the game was a collective, "Meh." True to the shining example of Lionhead Studio's fearless leader - Peter Molyneux - lead combat designer Mike West had some choice words for those who didn't like his game, while talking about what PC gamers can expect with the port that is available today. "Generally what happens when there's any information about Fable or about Peter Molyneux, you get a complete black and white - pardon the pun - split of forum replies. Half of the people, whatever it's about - if Peter has made the most sensible comment about games development ever - just spout obscenities and terrible, ridiculous things," West said. But it's the people who criticize the story that really bug him. "People saying the story wasn't very good was unfair. It's an interesting situation of you gather people together and then defeating the main bad guy. It's a pretty good story and it's pretty fun," he said. Part of the problem may be that gamers don't know what they are playing. "It's a frustrating situation to be in because we make good games, but people expect something that no one else is doing," said West. "We're making a co-operative role-playing game - there aren't any co-operative role-playing games out there, we're the only one." The difference in tone is also something West doesn't think people understood. "[Fable III is] a different type of game: it's more of a fun, comedic TV show than a serious Lord of the Rings film. I think a lot of people that play it think it's a Lord of the Rings - and it isn't. The vocal talents are something that he wishes got more credit instead of some random FPS. "I'm slightly disappointed we haven't won any audio awards to be honest, because our music's great, our vocal talent's great - and then you'll see a standard shooter get an audio award. I just think that's because they're more popular than us." So how did it work adapting the game to the PC controls? "We didn't want to make it feel like a port. The main thing was to completely redo the control system. It's a modal system now where you switch between modes and the mouse buttons do different things," he said. "The second big change is the engine, with the high resolution and the 3D as well. Fable and Albion have never looked better for anyone on any machine. The Xbox guys got it first, but the PC guys are going to have a much better version. "This is definitely the best Fable PC - it's much better than Fable 1," West said. Well, seeing as there was no PC version of the second game, that's a pretty short list.